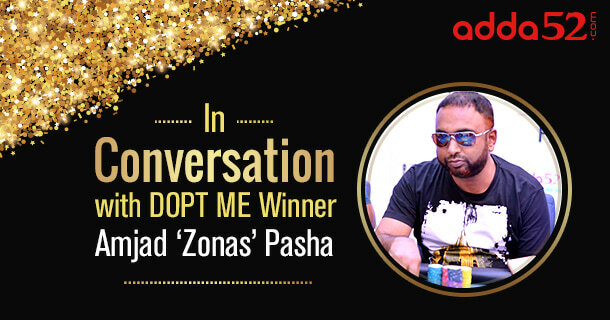 Hailing from the silicon city of Bangalore, Amjad ‘Zonas’ Pasha is one of the emerging poker players in the country who picked up the game just one and half year ago. Mostly playing on his favourite poker site-Adda52.com, he is a real money minter whose story will fascinate almost every poker enthusiast. ‘Zonas’ won a satellite ticket to DOPT Main Event on Adda52.com and went on to make it to final table on 27th August. Later, on the final table played live at Deltin Royale in Goa on 14th September, he started as one of the shortest stacks in chip and went down to 5-6 Big Blinds at a time. However, he turned around his game, made a strong comeback and went on to win the Main Event for a whopping INR 10,40,000 in top prize money after defeating Manish ‘NEWKIDPOKER’Lakhotia in the heads-up battle who walked away with INR 6,60,000 for his remarkable runner-up finish in the event. 1. First of all, congratulations on winning DOPT Main Event held this month in Goa! For our readers who don’t know much about you, tell us when and how did you get into poker? Amjad- I am a 46 year-old businessman and poker player from the silicon city-Bangalore who got started with Teen Patti about one and half year ago. Later, I created my account on Adda52.com and couple of other online poker sites. Thus, my journey of online poker began. 2. Coming back to DOPT Main Event, how does it feel after wining such a big tournament? Amjad – Winning such a tourney is always special. So, I feel really happy after shipping it. 3. Please tell our readers about your views about DOPT Main Event on Adda52? Amjad – It is a well-structured tournament on Adda52.com. It was really exciting to ship it. 4. You won a satellite to DOPT Main Event. What intrigued you to join this satellite? Amjad – Satellites on Adda52 are amazing. I love satellites here, because I can win tickets to bigger prizepool tourneys, that too at minimal buy-ins. So, I always appreciate satellites on Add52.com. 5. Adda52.com is planning special WPT Satellites. Will you be joining these satellites? Amjad –Yeah, I love satellites on Adda52 and will for sure be playing WPT Satellites here. 6. Amjad, you won a satellite to DOPT Main Event and then went on to win the event. Please describe your journey from winning satellite on Adda52 to shipping this event finally. Amjad – Yeah, it was a smooth journey. I was lucky enough to win some big spots. At the final table in Goa, I started 7th in chips. Since I was a bit short stack, I played very aggressively at the final table. I specially targeted the chip lead Abhishek‘abhishek47aj’ Jalan and luckily got most of my chips from him. The big pot I won initially at final table was when I held pocket eights (8-8). I went all-in and Jalan made the call with A-3. So, this was the big hand that helped me to come back into the game. 7. Describe your journey through DOPT Main Event final table. Any special and key hands? Amjad – Great journey! I won some big spots to chip up and take the lead finally. My special hand was pocket eights (8-8), which helped to win big from Jalan. It gave me a good comeback at the final table. 8. What do you think was the toughest hand in this tournament? Amjad – I think, it was K-J. I hit a Jack on the flop, but could not read Jalan who held 10-10. Eventually, I folded my K-J after a big bet from the chip lead Abhishek ‘abhishek47aj’ Jalan. That, ‘I think’, was the toughest hand where I got confused and couldn’t decide whether to call or bet. So, I folded. 9. Who do you think was your toughest opponent at the DOPT Main Event Final Table? Amjad – Of course, it was Manish ‘NEWKIDPOKER’ Lakhotia. He gave me hard time at the final table. He proved really tough in heads up as well. He played smartly and I really appreciate his game. 10. You beat Manish ‘NEWKIDPOKER’ Lakhotia in heads-up. Can you describe your heads up game? Amjad – I entered the heads-up game with a commanding chip lead, but it was not so easy for me. The heads-up was really tough with Manish. But luckily for me, I managed to beat him in the heads-up. We came up and down in chips. On the final hand, I had J-5 and Manish held K-7. While he hit a pair of Kings, I got 2 Jacks on the board and won the title with three of a kind. 11. Do you prefer playing live or online? If online, which poker site do you prefer to play at and why? Amjad – I prefer playing online poker. I prefer to play mostly on Adda52.com, because this website offers amazing satellites and tournaments. To be frank, I play almost all the satellites on Adda52.com. 12.Who are the best online MTT players in your opinion and why? Amjad – There are many, but NEWKIDPOKER is one of the best players, according to me. 13.How do you spend your time when not playing poker? Amjad – I spend the rest of time in my business. I am a foodie and enjoy eating my favourite dishes outside at some selected restaurants. My favourite food is Biryani- I just love it. 14. What are you future plans in online and live poker? Amjad – Planning ahead for WPT satellites on Adda52.com to qualify for WPT India to be held in Goa. 15. Finally, any advice or suggestion for aspiring poker players in India? Amjad – Study hard and learn the game. Consult pros and coaches and continue improving your skills. Thanks and good luck for the rest of tournaments and satellites on Adda52.com!